The workday has officially ended, house chores have been completed, dinner has been cleared away, and the little ones are in bed: now it’s mommy time. I look forward to the peace and quiet before bed more than any other part of my day, when I can relax and decompress before turning in for the night. Usually I’ll shower, get ready for bed and sink into the mattress, ready to almost instantly drift off but lately its been a little harder than normal to get into the relaxed state required to fall asleep as quickly as I’d like. To say that I’ve gone to bed frustrated a lot lately is an understatement. I have tried everything from sound music to sleep meditation. Being comfortable is one of my biggest needs when it comes to sleep. If I’m even the slightest bit uncomfortable (try having the kids lounging in bed with you dropping crumbs from movie night and cleaning all but a few minuscule bits away!) then I can tell you that I won’t be getting a wink of sleep until the obstacle has been removed. One of the biggest gripes I’ve always had about not being able to get comfortable has been from my pillows. Some people get a lot of use out of their pillows before upgrading but as particular as I am, I switch them out quite frequently. The recommended life span of your average pillow runs about 6 months or less but mine might last half that long, depending on how quickly they go flat or stop being comfortable enough for me. 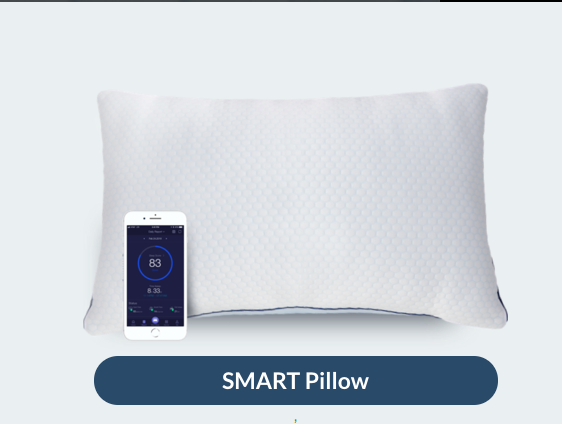 Partnering with iSense was perfect timing, considering my dilemma; when they reached out and offered to send out one of their Smart Pillows, I was intrigued. I’ve tried a lot of different pillows over the years in my quest for comfort, and iSense’s claim of a smart pillow was definitely something that caught my attention. I said yes and my pillow arrived on my doorstep just days later. I don’t like to make false claims about a product nor would I recommend something to my readers that I wouldn’t recommend to my own loved ones, so, I’m happy to say that so far I’ve enjoyed the Smart Pillow. Hypoallergenic to resist dust mites & mold, and CertiPur-US Certified, the Smart Pillow is able to be spot cleaned and is adjustable to fit your ideal level of comfort. Being able to adjust the pillow was my biggest area of interest, which turned out to be as easy as either removing or adding foam to increase or decrease soft/firm levels. Depending on my mood from night to night, being able to do so has been amazing for increasing the quality of my sleep each evening. Each pillow manufactured by iSense is naturally comforting, and the Smart Pillow is no different. The design of the pillow is a patented, cross-cut filling that has been uniquely designed to provide responsive support to the always changing sleep positions of the user. Each individual piece is fiber that is spun to prevent lumping and clumping, two of the most frequent reasons that I get so fed up with my old pillows so quickly. Additionally, the fall weather has been moving in for awhile but my body temperature has always been unusually high- this makes the Gel-infused memory foam and aqua fiber lining a true God send for me. The materials used are designed specifically to pull moisture away from your neck as well as your head in order to keep you cool & dry the entire night through. It has been amazing not to wake up midway through the night just to flip my pillow over for a cooler effect. Able to score your sleep: Thanks to the app for your pillow, your phone is capable of compiling an analysis of your sleep patterns, respiratory rates, heart rate, movement and sleep quality. I love the pillow app. See your improvement: Use personalized tips to improve your sleep score and ultimately your health. View health analysis: View heart rhythm, respiratory rate and other possible reasons for interrupted sleep. I haven’t had my Smart Pillow for very long but I can tell you one thing and that’s that I’m very impressed so far. Not only is it comfortable but it’s also helped improve my quality of sleep, kept me informed about my nightly stats and helped cool me down at night. To find out more about iSense and their available pillow options, you can visit them online or become a follow of their social media sites like Facebook|Twitter|Pinterest|Youtube. Kids Race Tracks with the Max Flex RC 300 Combo Edition!